Identify parts for security and quality control with Markal UV markers. Excellent for marking non porous sufaces. 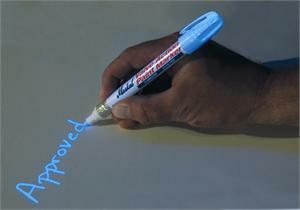 Markal UV markers are fast drying and do not contain xylene. Mark automotive parts, plastics part, and nearly any surface, Markal UV marks are invisible until illuminated with UV light.